If the previous Sheaffer was not the right color for you, this 1937 500 Feather-Touch lever-filler Balance set is so stunning. The brown striped material is so rich and warm, complete with gold-filled trim and a visualated section. The fountain pen has a two-toned, fine nib. 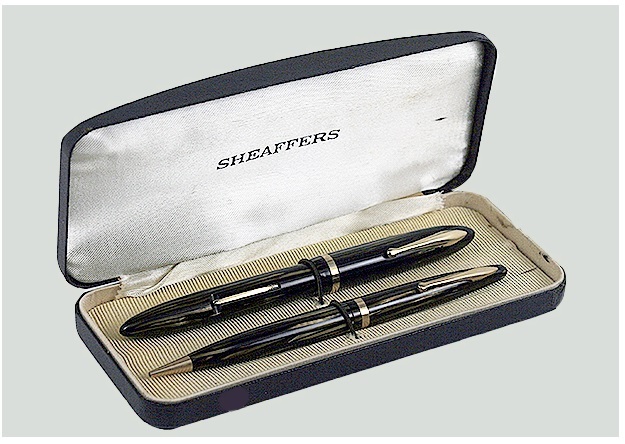 This entry was posted in Vintage Pens and tagged Featured Pens, Sheaffer. Bookmark the permalink. Follow any comments here with the RSS feed for this post. Post a comment or leave a trackback: Trackback URL.